This is the DFA passport appointment system guide online. As an initial suggestion, it is best and easier for passport renewal to do it in malls like Robinson's Place Ortigas. The branch had all the necessary facilities to cater to this specific need by Filipinos and foreigner passport holders. Same thing if you have technical problems with wrong spelling of your names and other technicalities. 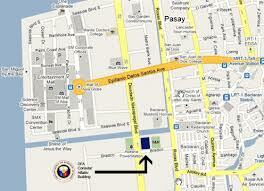 If you are looking for the different DFA Manila satellite office, please click here. For details on document authentication, you may read our post about it here - https://www.mypilipinas.com/dfa-red-ribbon.html. How to Set DFA Passport Appointment? If you think that getting a schedule to report and apply for a Philippine passport is hard to come up with, you are wrong. Today, an applicant have 2 choices to set a schedule for application via the new dfa passport appointment system. It can be for renewal, new passport or lost passport. The first one is by calling the hotline at telephone number - (02) 737-1000. This is the Teleserve process wherein any qualified applicant may opt in for extra paid service to have the appointment and submission of requirements done by a customer service. Here, all you have to do is to report on a designated date for photo imaging and biometrics. Call the Teleserve hotline at (02) 737-1000 for DFA passport appointment. Provide details to customer service representative. Set a pick up date for the documentary requirements. Prepare complete up all documents / requirements on or before the scheduled pick up date. If calling is not your type, you may opt in to Log on to www.passport.com.ph and input all your details using the online application form. Then choose the time and date of pick up of your requirements / documents by the Teleserve courier. On your filled up pick up date, expect a courier to come to your address to pick up all the documents needed for passport application including the payment for the assistance program by Teleserve. The courier will bring to Teleserve for receiving, the application form, documents you submitted and your payment. All will be forwarded to DFA ASEANA for application. You will be called and asked by Teleserve to report to DFA office in Macapagal Boulevard on a scheduled date for biometric thumbprint encoding and digital photo capture. Courier will deliver your released passport right in to your doorstep. Be sure to check your new passport for damage, discrepancy or any concerns before signing up a received form. The second choice is to apply at the official website via online reservation system or online setting for DFA passport appointment schedule. Here, you will be obliged to fill up your complete details using an online application form. Afterwards, you will be sent via email, a confirmation link. You will have to click on that link to arrive at a list of procedures and things to do before reporting for your final schedule. Be sure to list down what documents you have to bring and what time and date you have to report for the application. You will be given a ticket or pass which you will present to the DFA guard to prove you have an appointment on that date. Watch the video below as your official guide on filling up the form form for DFA passport appointment schedule setting. 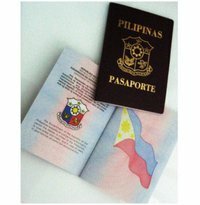 Because the application form is the most important requirement and pre-requisite for DFA passport appointment application in the Philippines as well as in other DFA satellite branches and consulate offices abroad, I will give you an official download of the form which you can get here - https://www.mypilipinas.com/support-files/dfa_e_passport_application_form.pdf. This way, you won't have to go anywhere. How to Renew Passport in DFA? "Ang trabaho ng DFA" (function of DFA) is to assist in all passport related concerns as well as diplomatic relations and communications with other countries. One of which is let Pinoys and interested passport applicants to know how to renew a Philippine passport. It is why today, 2014, this agency of the Philippine government has put up more options to come and apply in person as well as online via the DFA passport appointment setting option. This is also the main reason why satellite branches of DFA in Manila have been put up and if you click on the previous link, you will find that target areas are popular malls in Metro Manila. This includes an office in SM Megamall, SM Manila, Alabang Town Center Mall and Robinson's Place Galleria. To see DFAs address and hotline telephone numbers, visit the link I just posted for Manila offices above or see the map below (visit Google Maps). Complete up the list of basic requirements below. (See list of requirements for green and brown passports below). 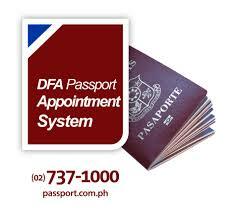 Fill up the online application form for DFA passport appointment system. Verify your email by clicking on the link sent by auto generated system of the DFA website. List and copy the terms on reporting for schedule of your application date. Print the e ticket which you will present to the guard at the gate when your schedule comes. What Are the Documentary Requirements in Applying for Passport in the Philippines? Birth Certificate (BC) in Security Paper (SECPA) issued by the National Statistics Office (NSO) or Certified True Copy (CTC) of BC issued by the Local Civil Registrar (LCR) and duly authenticated by NSO, to determine complete middle name. Transcribed Birth Certificate from the LCR is required when entries in NSO Birth Certificate are blurred or unreadable. Bring original green passport and photocopy of first and last page of passport before coming in person for your scheduled DFA passport appointment date. How Much Fees to Pay for Philippine Passport? How to Extend Validity of Philippine Passport? 4. The extension of the validity of passport should not be considered as an alternative in lieu of a renewal of the passport. c. The affidavit must be duly authenticated by the Philippine Consulate where a person is applying for the renewal of the said passport. 7. In the application for the extension of the validity of his/her passport, the fee for affidavit required is waived as it addresses an emergency situation and is considered to be done gratis or free of charge. The applicant should only be charged with a flat fee of $20 for amendment of passport and shall be paid prior to any extension. You may view and download a copy of the original transcript taken from the official website of the Philippine consulate as stated in the source below. Alternately, you may call the hotline numbers for DFA passport appointment listed at the beginning of this page above. If you want to know how to cancel appointment, there is no way to do that if you opted in for an online reservation. You may only apply for one date to report and apply or renew your passport. On the other hand, for now show application, that is impossible at most of the time because the question of how will the department get your actual latest photo if you will not show to the office of the DFA to apply for your passport in the first place?